We think of Rock Island as a city of parks, especially large rambling parks. But a century ago, parks and public spaces tended to be much smaller and more formal. This postcard, from around 1910, depicts such a park in its heyday. It is Garnsey Square, which included the entire block between Fifth and Sixth Streets and Third and Fourth Avenues. The site is now under the Rock Island Expressway. Garnsey Square started life as Franklin Square, which is shown on maps as early as 1855. Although dedicated as a public space, Franklin Square wasn’t really a park. Instead, it was unimproved land that was used as a source of gravel, providing material for public improvements. Rather than a deep excavated gravel pit, the gravel was probably on the surface, deposited during high water times. In 1890, a group of citizens formed the West End Improvement Association, with the intent of improving Franklin Square into a landscaped public space. First they renamed the land as Garnsey Square, in honor of Daniel G. Garnsey (sometimes called Gurnsey). Garnsey was a son of pioneer settlers here who, many years earlier, had laid out the addition where the square was located. Moreover he had donated his interest in this square to the city. The Improvement Association quickly raised enough money to remove a “heavy” grove of locust trees, excavate several feet of gravel deposit, and refill the area with soil. Then they proceeded to make other improvements to the park, many of which were donated. By 1892, it was reported that Contractor Nelson was laying tile crosswalks in Garnsey Park. These sidewalks went diagonally from each corner to the center, where contractor Charles Larkin was donating his labor to build a large round basin for the fountain, which would be installed later. The fountain’s basin, surrounded by an ornate iron fence, was similar to that already built in Spencer Square, but this fountain was different. As shown in the center of this postcard, the Garnsey Square fountain was a tall and elegant structure with four tiers of cascading water. What a sound the falling water must have produced as it flowed from one level to another! The diagonal sidewalks within the square created four distinct triangular zones. In the west triangle was the bandstand, visible at the left on the postcard. This also indicates the postcard view of the square is looking to the northeast. The east triangle held a drinking fountain, and the north and south triangles had vases and ornaments. This elegant square was truly an oasis in the urban landscape. Although Rock Island did have a park department at the turn of the century, the concept of publicly maintained places was rather new here. It didn’t take long to catch on, though, and by 1925, it was reported that Rock Island had two large parks – Longview and Lincoln – as well as several smaller ones — Spencer, Garnsey, Douglas, Denkmann, Reservoir – and a municipal tourist camp as well, located west of 9th Street at 47th Avenue. 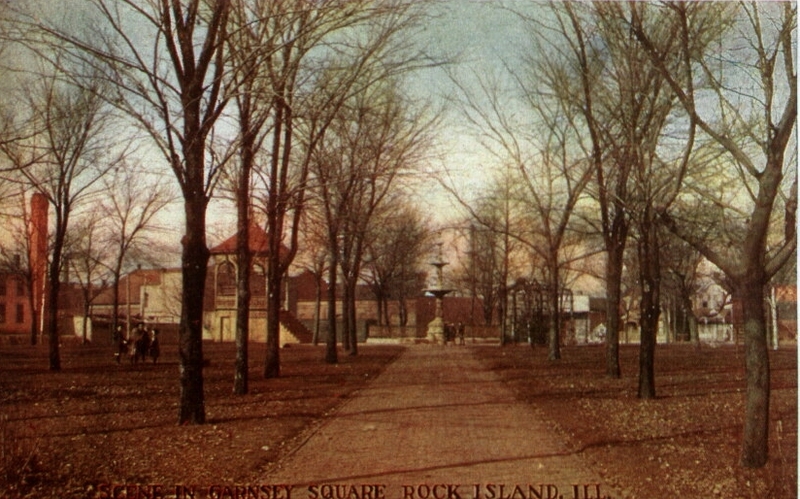 Garnsey Park graced the west end of Rock Island until 1960, when 143 parcels of land, most with buildings, were cleared, calling it “urban renewal” and to build a new expressway. However even earlier it had been compromised, as workers at nearby J. I. Case had used portions of the square for a parking lot since the days of WWII. The parking was discontinued in 1956, and playgrounds were once again improved. Ironically, the urban renewal project was called the Garnsey Square Urban Renewal Project, even as the square was destroyed. It was reported that Garnsey Square’s four-tier fountain was removed to Longview Park where it can still be seen. Alas, water no longer flows in any of our historic fountains — they are now dry as a bone! This article by Diane Oestreich is slightly modified from the original, which appeared in the Rock Island Argus and Moline Dispatch on February 17, 2002.